In 1996, my wife and I bought an 18-foot Chriscraft Bowrider. 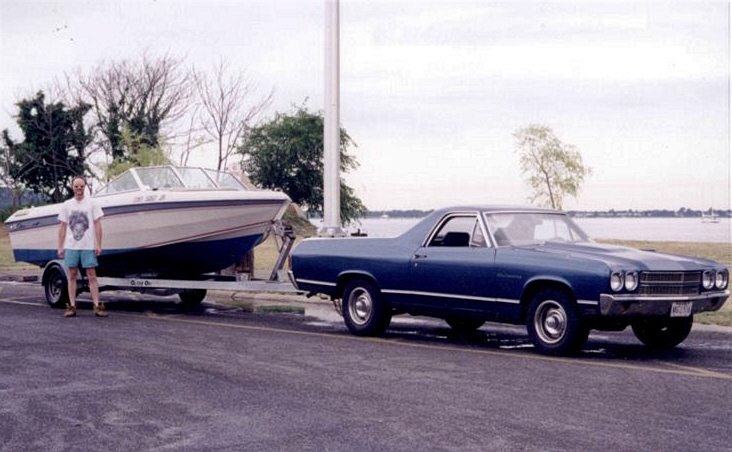 We were living on Long Island at the time, and were looking forward to trailering it to the shore for a day's outing. I decided this was the time to replace the front drums on my 1970 El Camino with disc brakes. Converting from drum brakes to disc brakes on your old car has several advantages. Disc brakes shed heat much faster, which improves repeated braking performance. Also, when disc rotors get wet, they dry off much quicker than drums do. They also have less moving parts than drums, and don't require any periodic adjustment. Swapping to a set of front disc brakes is a relatively simple job, one that a weekend mechanic could accomplish with hand tools. There are two options to choose from when converting front manual drum brakes to power discs. You can either scrounge up good used parts from a donor car, or buy an aftermarket brake conversion kit. For those of you with a GM A-body car (like my old El Camino), a front disc brake swap is very common. 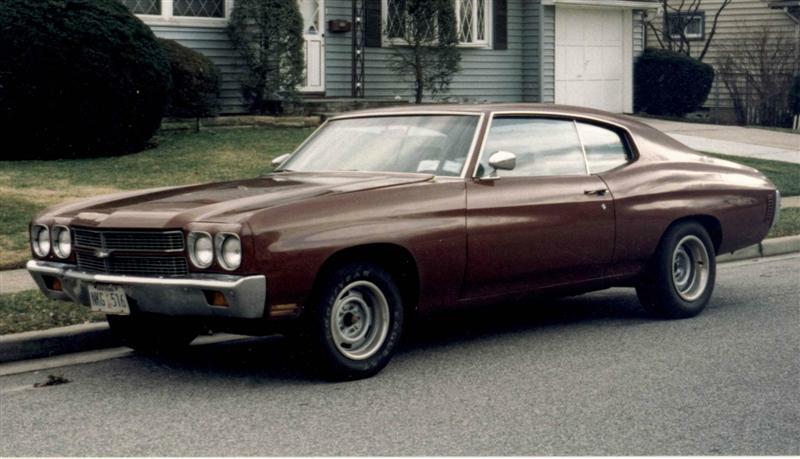 These include 1964-1972 Chevelle and Monte Carlo, Pontiac Lemans and GTO, Olds Cutlass and 4-4-2, and Buick Skylark. Because all these years and models shared the same brakes and suspension parts, you can swap the later 1968-1972 factory discs to the drum-equipped models. Keep in mind that if swap the later discs to the drum-equipped models, you'll need at least 15" wheels in order to use discs on the early cars. This is because the brake calipers will hit the inside of the smaller 14" wheel. Twenty years ago, it was cheaper and easier to find good used brake parts, but today, the rising value of original classic cars makes them harder to find and more expensive. Plus, relying on 50 year-old parts to stop your classic car is not the best idea. It just makes sense to buy a quality aftermarket kit. 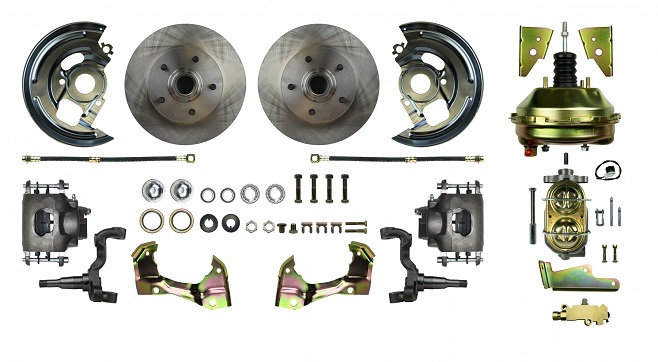 With a good aftermarket brake kit, the parts-gathering has been done for you, and the conversion is a fairly simple weekend operation. Drum to disc conversion kits range in price from $350 and up. Kits generally include calipers, pads, rotors, hoses, bearing and hardware kits, caliper mounting brackets, backing plates (most kits) and spindles (when changing spindles is necessary). 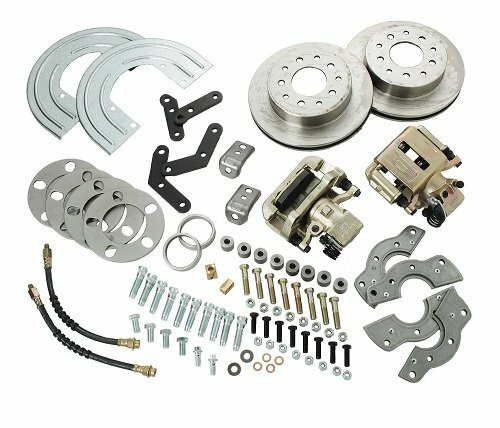 Manual disc conversion kits contain the same components as the drum-to-disc conversion kit, but also include a master cylinder, power brake booster and proportioning valve. 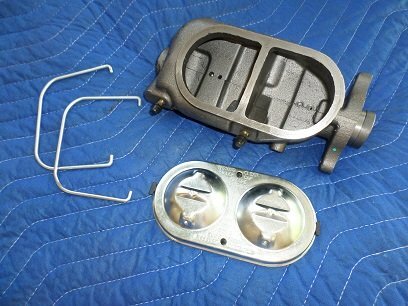 Many American cars built before mid-sixties have a single master cylinder. In this system, if you experience a brake line failure you lose all of your braking capacity! 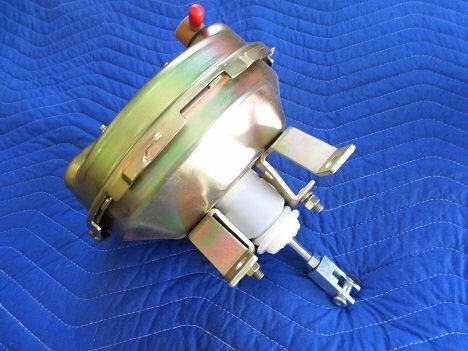 Most disc brake kits will include a later-style master, so converting from drum to disc will automatically give you the safer dual master cylinder. All 1964-1966 A-bodies came from the factory with a single-reservoir master cylinder. In 1967, GM upgraded to a safer dual-reservoir master cylinder. You could run manual disc brakes, but for disc brakes to operate efficiently, they need a lot more line pressure than drums do. 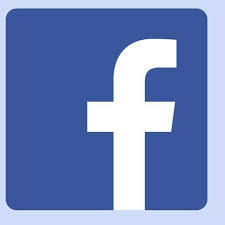 In other words, a stock drum-brake master cylinder does not have the added volume of brake fluid needed to operate disc brake calipers effectively. Power brakes give much improved stopping performance. The power booster adds pressure, so your foot doesn't have to! Manual to power brake conversion components include a dual-reservoir master cylinder, power brake booster and proportioning valve. If you have a less than popular make and model, you can still switch from drum to disc, but not as easily. Several companies offer mounting brackets to fit another brand disc brake onto your car's front end. If these are not available for your year and model, you would then need to fabricate mounting brackets yourself or have them custom-made. The parts needed are the two front calipers, disc brake spindles, backing plates, and brake hose brackets. Unless the old rotors are in very good shape, buy new ones. Never re-use old rubber brake hoses. Be cautious when buying kits sold as "universal". Some of the cheaper kits don't include all parts needed, like the disc-brake backing plates. Sometimes a disc brake spindle/rotor combination will place your wheel 3/4" outboard of where the drum-equipped wheel was. Stay away from companies with a "No Return" policy. Once you bolt it on you can't return it -- how do we know it will work if we don't bolt it on? Do NOT assume that your existing brake lines will work when converting from drum to disc brakes. This includes the brake line from master cylinder to the frame mount fitting and the line that runs from left front to right front. In all likelihood, one or more lines will need to be replaced. If you're thinking of adding horsepower, it's a good idea to have more stopping power. But before you add rear disc brakes, do your homework - you could end up with a car that stops worse than it did before. If you're running the stock-size 14" or 15" inch wheels, a front disc/rear drum setup is all you really need for street use. A rear disc conversion should only be considered if have substantially increased horsepower, or you've installed 17" or 18" tires. Oversize wheels and tires may also rub inner fender-wells, or may bottom out over a speed-bump or pothole. In addition to the safety and performance improvements, replacing drums with discs will also allow for a wider selection of wheels to choose from, as well as a larger selection of suspension mods. If you drive your old car more than 1,000 miles a year (or pull a boat), relying on 50-year-old brakes may not be a good idea. 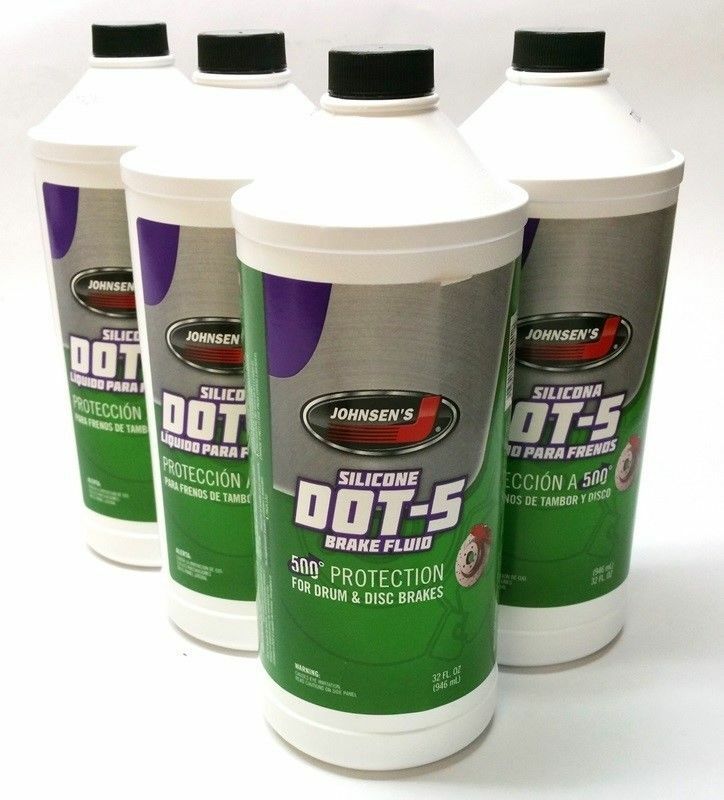 Ultimately, it makes your old car safer and more enjoyable to drive.